We will not detail the steps by which Napoleon became Emperor. His coronation was the most extraordinary revival of stale history that it is possible to imagine. Cæsar was no longer the model; Napoleon was playing now at being Charlemagne. 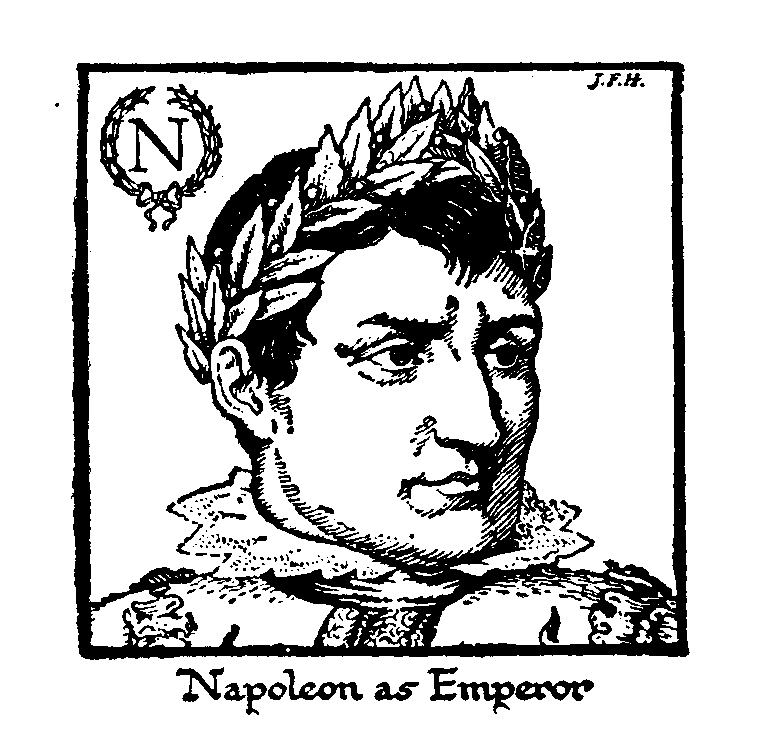 He was crowned emperor, not indeed at Rome, but in the cathedral of Notre-Dame in Paris; the Pope (Pins VII) had been brought from Rome to perform the ceremony; and at the climax Napoleon I seized the crown, waved the Pope aside, and. crowned himself. The attentive reader of this Outline will know that a thousand years before this would have had considerable significance; in 1804 it was just a ridiculous scene. In 1806 Napoleon revived another venerable, antiquity, and, following still the footsteps of Charlemagne, crowned himself with the iron crown of Lombardy in the cathedral of Milan. All this mummery was to have a wonderful effect upon the imagination of western Germany, which was to remember that it, too, had been a part of the empire of Charlemagne. The four daughter republics of France were now to become kingdoms; in 1806 he set up brother Louis in Holland and brother Joseph in Naples. But the story of the subordinate kingdoms he created in Europe, helpful though this free handling of frontiers was towards the subsequent unification of Italy and Germany, is too complex and evanescent for this Outline. The pact between the new Charlemagne and the new Leo did not hold good for very long. In 1807 he began to bully the Pope, and in 1811 he made him a close prisoner at Fontainebleau. There does not seem to have been much reason in these proceedings. They estranged all Catholic opinion, as his coronation had estranged all liberal opinion. He ceased to stand either for the old or the new. The new he had betrayed; the old be had failed to win. He stood at last for nothing but himself. There seems to have been as little reason in the foreign policy that now plunged Europe into a fresh cycle of wars. Having quarreled with Great Britain too soon, he (1804) assembled a vast, army at Boulogne for the conquest of England, regardless of the naval situation. He even struck a medal and erected a column at Boulogne to commemorate the triumph of this projected invasion. In some «Napoleonic» fashion the British fleet was to be decoyed away, this army of Boulogne was to be smuggled across the Channel on a flotilla. Of rafts and boats, and London was to be captured before the fleet returned. At the same time his aggressions in south Germany forced Austria and Russia steadily into a coalition with Britain against him. In 1805 two fatal blows wore struck at any hope be may have entertained of ultimate victory, by the British Admirals Calder and Nelson. In July the former inflicted a serious reverse upon the French fleet in the Bay of Biscay; in October the latter destroyed the joint fleets of France and Spain at the battle of Trafalgar. Nelson died splendidly upon the Victory, victorious Thereafter Napoleon was left with Britain in pitiless opposition, unattainable and unconquerable, able to strike here or against him along all the coasts of Europe. But for a while the moral wound of Trafalgar was hidden from the French mind altogether. They heard merely that «storms have caused us to lose some ships of the line after an imprudent fight». After Calder’s victory he had snatched his army from Boulogne, rushed it across half Europe, and defeated the Austrian and Russian armies at Ulm and Austerlitz. Under these inauspicious circumstances Prussia, came into the war against him, and was utterly defeated and broken at the battle of Jena (1806). Although Austria and Prussia were broken, Russia was still a fighting power, and the next year was devoted, to this unnecessary antagonist of the French, against whom an abler and saner ruler would never have fought at all. We cannot trace in any detail the difficulties of the Polish campaign against Russia; Napoleon was roughly handled at Pultusk, which he announced in Paris as a brilliant victory and again at Eylau. Then the Russians were defeated at Friedland, (1807). As yet he had never, touched Russian soil, the Russians were still, as unbeaten as the British, but now came an extraordinary piece of good fortune for Napoleon. 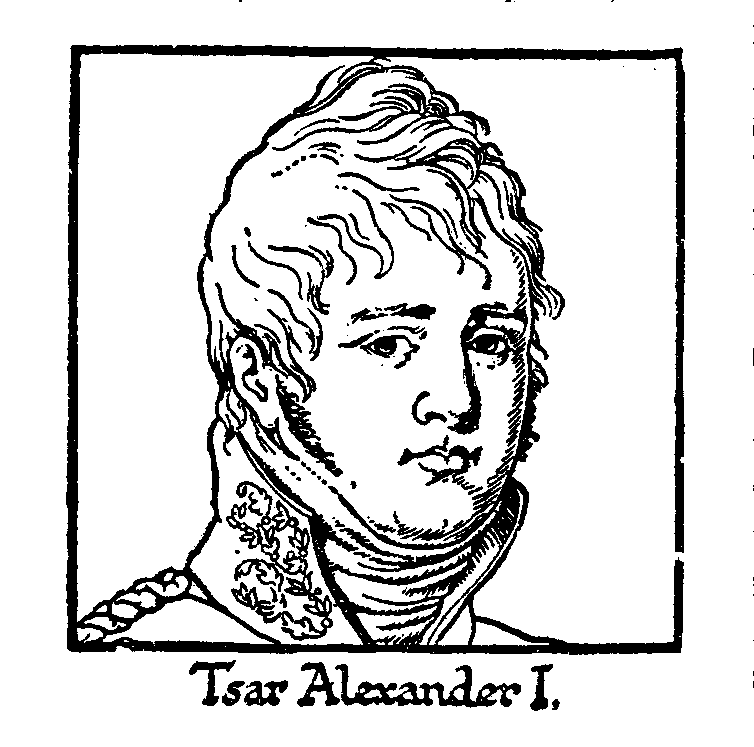 By a mixture of boasting, subtlety, and flattery be won over the young and ambitious Tsar, Alexander I he was just thirty years old to form an alliance. The two emperors met on a raft in the middle of the Niemen at Tilst, and there came to an understanding. This meeting was an occasion for sublime foolishness on the part of both the principle actors. Alexander had imbibed much liberalism during his education at the court of Catherine II, and was all for freedom, education, and the new order of the world subject to, his own pre-eminence. «’He would gladly have everyone free», said one of his early associates, «provided that everyone was prepared to do freely exactly what he wished». And he declared that he would have abolished serfdom if it had cost him his head-if only civilization had been more advanced. He made war against France, he said, because Napoleon was a tyrant, to free the French people. After Friedland he saw Napoleon in a different light. These two men met eleven days after that rout; Alexander no doubt in the state of explanatory exaltation natural to his type during a mood of change. To Napoleon the meeting must have been extremely gratifying. This was his first meeting with an emperor upon terms of equality. Like all men of limited vision, this man was a snob to the bone, his continual solicitude for big titles shows as much, and here was a real emperor, a born emperor, taking his three-year-old dignities as equivalent to the authentic imperialism of Moscow. Two imaginations soared together upon the raft at Tilsit. «What is Europe?» said. Alexander. «We are Europe». They discussed the affairs of Prussia and Austria in that spirit, they divided Turkey in anticipation, they arranged for the conquest of India, and indeed of most of Asia, and that Russia should take Finland from the Swedes; and they disregarded the disagreeable fact that the greater part of the world’s surface is sea, and that on the seas the British fleets sailed now unchallenged. Close at hand was Poland, ready to rise up and become the passionate ally of France had Napoleon but willed it so. But he was blind to Poland. It was a day of visions without vision. Napoleon even then, it seems, concealed the daring thought that be might one day marry a Russian princess, a real princess. But that, he was to learn in 1810, was going a little too far. After, Tilsit there was a perceptible deterioration in Napoleon’s quality; he became rasher, less patient of obstacles, more and more the fated master of the world, more and more intolerable to everyone he encountered. In 1808 he committed a very serious blunder. Spain was his abject ally, completely under his control, but he saw fit, to depose its Bourbon king in order to promote his brother Joseph from the crown of the two Sicilies. Portugal he had already conquered and the two kingdoms of Spain and Portugal were to be united. Thereupon the Spanish arose in a state of patriotic fury, surrounded a French army at Baylen, and compelled it to surrender. It was an astonishing break in the French career of victory. The British were not slow to seize the foothold this insurrection gave them. A British army under Sir Arthur Wellesley (afterwards the Duke of Wellington) landed in Portugal, defeated the French at Vimiero, and compelled them to retire into Spain. The news of these reverses caused a very great excitement in Germany and Austria, and the Tsar assumed a more arrogant attitude towards his ally. There was another meeting of these two potentates at Erfurt, in which the Tsar was manifestly less amenable to the dazzling tactics of Napoleon than he had been. Followed four years of unstable «ascendancy» for France, while the outlines on the map of Europe waved about like garments on a clothesline on a windy day. 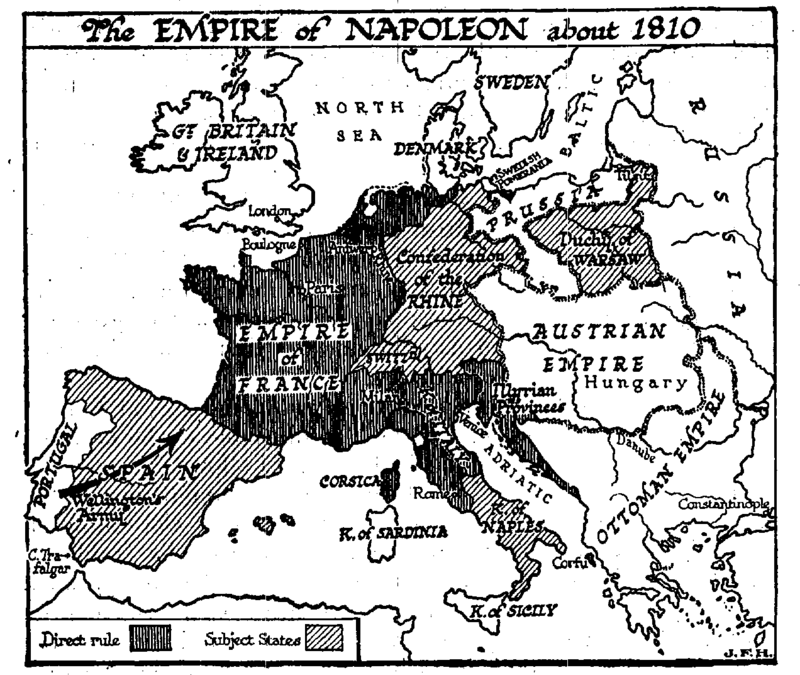 Napoleon’s personal empire grew by frank annexations to include Holland, much of western Germany, much of Italy, and much of the, eastern Adriatic coast. But one by one the French colonies were falling to the British, and the British armies in the Spanish peninsula, with the Spanish auxiliaries, slowly pressed the French northward. All Europe was getting very weary of Napoleon and very indignant with him; his antagonists now were no longer merely monarchs and ministers, but whole peoples also. The Prussians, after the disaster of Jena in 1806, had set to work to put their house in order. Under the leadership of Freiherr von Stein they had swept aside their feudalism, abolished privilege and serfdom, organized popular education and popular patriotism, accomplished, in fact, without any internal struggle nearly everything that France had achieved, in 1789. By 1810 a new Prussia existed, the nucleus of a new Germany. And now Alexander, inspired it would seem by dreams of world ascendancy even crazier than his rivals, was posing again as the friend of liberty. In 1810 fresh friction was created by Alexander’s objection to Napoleon’s matrimonial ambitions. For he was now divorcing his old helper Josephine, because she was childless, in order to secure the «continuity» of his «dynasty». Napoleon, thwarted of a Russian princess, snubbed indeed by Alexander, turned to Austria, and married the arch-duchess Marie Louise. The Austrian statesmen read him aright. They were very ready to throw him their princess. By that marriage Napoleon was captured for the dynastic system; he might have been the maker of a new world, he preferred to be the son-in-law of the old. In the next two years this adventurer’s affairs crumbled apace. Nobody believed in his pretensions any more. He was no, longer the leader and complement of the revolution; no longer the embodied spirit of a world reborn he was just a new and nastier sort of autocrat. He had, estranged all free-spirited men, and he had antagonized the church. Kings and Jacobins were, at one, when it came to, the question of his overthrow. Only base and self-seeking people supported him, because he seemed to have the secret of success. Britain was now his inveterate enemy, Spain was blazing with a spirit that surely a Corsican should have understood; it needed only a breach with Alexander I to set this empire of bluff and stage scenery swaying toward its downfall. The quarrel came. Alexander’s feelings for Napoleon had always been of a very mixed sort; he envied Napoleon as a rival, and despised him as an underbred upstart. Moreover, there was a kind of vague and sentimental greatness about Alexander; he was given to mystical religiosity, he had the conception of a mission for Russia and himself to bring peace to Europe and the world by destroying Napoleon. In that respect he had an imaginative greatness Napoleon lacked. But bringing peace to Europe seemed to him quite compatible with the annexation of Finland, most of Poland, and of great portions of the Turkish empire. This man’s mind moved in a luminous fog. And particularly he wanted to resume trading with Britain, against which Napoleon had set his face. For all the trade of Germany had been dislocated and the mercantile classes embittered by the Napoleonic «Continental System», which was to ruin Britain by excluding British goods from every country in Europe. Russia had suffered more even than Germany. The breach came in 1811, when Alexander withdrew from the. «Continental System». In 1812 a great mass of armies, amounting altogether to 600,000 men, began to move towards Russia under the supreme command of the new emperor. About half this force was French; the rest was drawn from the French allies and subject peoples. It was a conglomerate army like the army of Darius or the army of Kavadh. The Spanish war was still going on; Napoleon made no attempt to end it. Altogether, it drained away a quarter of a million men from France. He fought his way across Poland and Russia to Moscow before the winter-for the most part the Russian armies declined battle and even before the winter closed in upon him his position became manifestly dangerous. He took Moscow, expecting that this would oblige Alexander to make peace. Alexander would not make peace, and Napoleon found himself in much the same position as Darius had been in 2,300 years before in South Russia. The Russians, still unconquered in a decisive battle, raided his communications, wasted his army-disease helped them; even before Napoleon reached Moscow 150,000 men had been lost. But he lacked the wisdom of Darius, and would not retreat. The winter remained mild for an unusually long time he could have escaped; but instead he remained in Moscow, making impossible plans, at a loss. He had been marvellously lucky in all his previous floundering; he had escaped undeservedly from Egypt, he had been saved from destruction in Britain by the British naval victories; but now he was in the net again, and this time he was not to escape. Perhaps be would have wintered in Moscow, but the Russians smoked him out; they set fire to and burnt most of the city. Slowly, discipline dissolved. The hungry army spread it out in search of supplies until it broke up into mere bands of marauders. The peasants, if only in self-defense, rose against them, waylaid them, and murdered them; a cloud of light cavalry—Scythians—still hunted them down. That retreat is one of the great tragedies of history. At last Napoleon and his staff and a handful of guards and attendants reappeared in Germany, bringing no army with him, followed only by straggling and demoralized bands. The Grand Army, retreating under Murat, reached Konigsberg in a disciplined state, but only about a thousand strong out of six hundred thousand. From Konigsberg Murat fell back to Posen. The Prussian contingent had surrendered to the Russians; the Austrians had gone homeward to the south. Everywhere scattered fugitives, ragged, lean, and frost-bitten, spread the news of the disaster. Napoleon’s magic was nearly exhausted. He did not dare to stay with his troops in Germany; he fled post haste to Paris. He began to order new levies and gather fresh armies amidst the wreckage of his world empire. Austria turned against him (1813); all Europe was eager to rise against this defaulting trustee of freedom, this mere usurper. He had betrayed the new order; the old order he had saved and revived now destroyed him. Prussia rose, and the German «War of Liberation» began. Sweden joined his enemies. Later Holland revolted. Murat had rallied about 14,000 Frenchmen round his disciplined nucleus in Posen, and this force retreated through Germany, as a man might retreat who had Ventured into a cageful of drugged lions and found that the effects of the drug were evaporating. Napoleon, with fresh forces, took up the chief command in the spring, won a great battle at Dresden, and then for a time he seemed to have gone to pieces intellectually and morally. He became insanely irritable, with moods of inaction. He did little or nothing to follow up the Battle of Dresden. In September the «Battle of the Nations» was fought round and about Leipzig, after which the Saxons, who had hitherto followed his star, went over to the allies. The end of the year saw the French beaten back into France. 1814 was the closing campaign. France was invaded from the east and the south; Swedes, Germans, Austrians, Russians, crossed the Rhine; British and Spanish came through the Pyrenees. Once more Napoleon fought brilliantly, but now he fought ineffectually. The eastern armies did not go much defeat him as push past him, and Paris capitulated in March: A little later at Fontainebleau the emperor abdicated. In Provence, on his way out of the country, his life was endangered by a royalist mob.